Well. A thoroughly enjoyable, sun-soaked weekend had by all, within the impressive surroundings of Crownhill fort, Plymouth. Though a rather modern affair for a Napoleonic regiment, as the fort was completed in the 1870’s, we did manage to find a canon from that year of years 1815 on our exclusive tour of the amazing underground network of tunnel fortifications, which was a proud find. Well worth a visit, the fort is a mighty and highly interesting site, historically and architecturally, with many canon firing displays to make us feel at home. 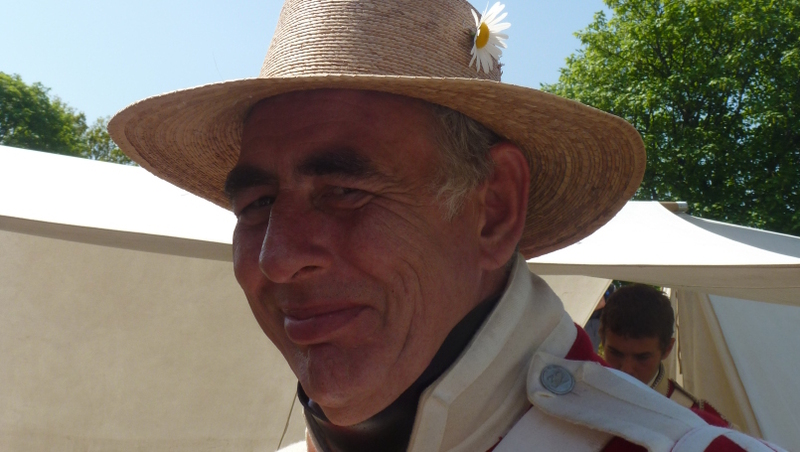 We were made incredibly welcome by Ed and all his staff at Crownhill, and there was never a shortage of tea, coffee or sandwiches for all the reenactors, so many thanks there. Adding to the tours and demonstrations run by the fort, our faithful 32nd did sterling service entertaining the many spectators with marching, banter, and some rather fine drill. After firing a few volleys at the crowd and charging at them, bayonets fixed, we retired to our idyllic, and rather homely camp. We took great pride in our bivouac, and no effort was spared to show as many aspects of Napoleonic life as we could, with a large kitchen display (much reduced by Sunday as we’d eaten it all! ), a roaring fire with kettles bubbling and a full armourer major’s forge, where guns were cleaned and serviced, much to the intrigue of the public. The highlight of the weekend was undoubtedly the long-awaited return of our ‘Orrible Sarge Tiny Castle and three Huzzars were duly cheered by the troops. Delighted to have you back Sir! After a whip-round of Wellington’s army our onion chopper in chief managed to present to Tiny the most luxurious, extravagant gift we could think to bestow… A real pineapple! Matured for three days hung from an English oak, and deftly caught by Pvt. Terry on the end of his bayonet, it was a treat the luxury of which we had never before seen the like! We were a happily busy bunch preparing meals, making shako plumes, researching regimental history and generally larking about, though many of us still found time for the odd nap under the awning on what was a very sunny weekend indeed! There was a good old family feel to our camp, with the lovely Louise sewing a new bodice for herself in the sun, and one of our youngest members, little Willbert (age 4), practising his drill, complete with a miniature wooden musket. After putting him through his paces our good Sergeant was most confident we’ll make a redcoat of him yet. The Lady Mel brought a fine air of gentility to our vittels with the rum-soaked delight that is Mrs. Perrott’s pound cake; A two hundred year old recipe that still tickles ones fancy to this day. Coupled with some extremely fine hand embroidery she lent us much finesse. An unusual quality for us, it has to be said. As well as good grub and lots to see we were also treated to some highly evocative music, played by our regimental drummer, fifer, bugler, and all round fine chap Eddie. Never does a Napoleonic camp have such an atmosphere as when that haunting military melody, the theme to Blackadder, drifts through the woodsmoke in the gloaming. A very fine job done Sir, and thank you! Our colonel was drilling his troops admirably, threatening a good flogging, and reading up on his regimental history like all good Colonels should. He had with him a junior officer Danning as ensign and the 32nd colour was carried with pride! The ranks were boosted in numbers by Cliff ‘Bear’ Beaumont of the 43rd, our resident highlander Keith, and a rogue Chasseur Britanique, so many thanks to all you chaps for your numbers, company and slick drill. A hearty welcome also to brand new member Mark who cut a fine dash. Great to have you with us. Huzzar! A fantastic season already, and its barely begun. Our faithful 32nd are on the road to Waterloo in fine fettle. Onwards and Upwards! By Nicky Butland, 32nd Onion Chopper in Chief.